I just love Pad Thai. Now that I am vegan, I wanted to make a Vegan Pad Thai. This vegan pad Thai came out really yummy! 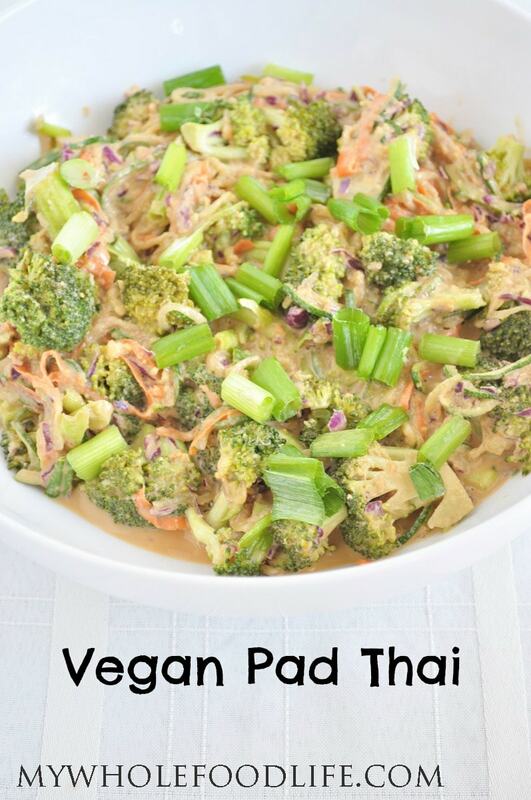 In addition to being vegan, this healthy pad Thai recipe is also gluten free and grain free! 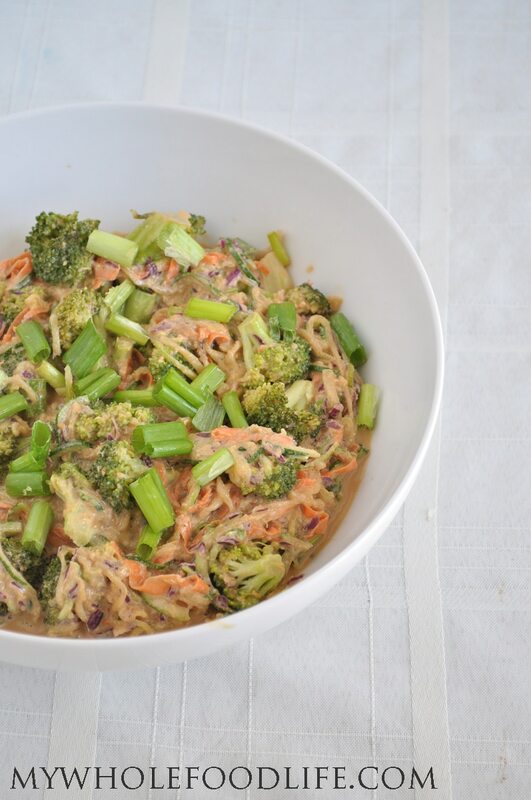 I used zucchini noodles to make this healthy pad Thai recipe. I just love my spiralizer . That is what I used to make the zucchini noodles. Totally worth getting in my opinion. This super easy recipe can be made up in no time at all. If you like to use your spiralizer, you may also like this and this. I highly recommend keeping the sauce and the vegetables separate until you are ready to eat. The zucchini noodles can release moisture that can make the sauce seem a bit watery. I actually spiralized my zucchini the day before I went to use it in the recipe. I just stored it in a strainer with a bowl underneath to catch the excess water. It seemed to work well. We actually ate this meal cold, but I am guessing you can heat it up as well. This may not taste exactly like traditional pad Thai, but it is a great option for vegans. Very yummy! A lower carb version of Pad Thai! Mix all the vegetables together in another bowl . Pour sauce over the vegetables and serve immediately. You can also add my homemade sriracha to this recipe. I used both peanut butter and tahini because I was short on peanut butter. Feel free to use peanut butter by itself if you like. If you are guten free or paleo, I highly recommend using the coconut aminos instead of soy sauce and almond butter instead of peanut butter. This should last in the fridge for at least 4 days. It's best to keep the sauce and vegetables separate until you are ready to eat them. Enjoy! Hello dinner! I have a spiralizer in the mail (or maybe at my doorstep) and CANNOT wait to use it. I love pad thai and have been looking for a good recipe! This is going on my list of "pad thai's to try". Thank you for sharing - looks DELISH! Thanks Sam! I hope you enjoy it as much as I did! Hey Melissa! We love this..but you could also use spaghetti squash in place of the zucchini Love it! We will have to give this a try! Thanks! I think that might work. I love the sound of this. Trying to make more things in bulk so making this sauce in bulk at start of week and then spiralising some veg on the day sound like the perfect answer for quick and tasty lunches! Thanks! I hope you enjoy the recipe. Thanks Melissa, I cannot wait to try this because i love your other pad thai recipe. I recently purchased a spiralizer and cannot bring myself to use it because nothing sounds great…but this does. Yum, can't wait to try this! I have just made this and it was delicious! I didn't have broccoli so I added some sautéed kale and some sugar snap peas. I also added a tablespoon of cooked quinoa as I had some leftover. Oh yum! So glad you liked it! Do you cook/saute the veggies first or is it mostly raw? You can saute if you like, but I ate it raw.